SEFAC was established in 1884 and the company launched its Heavy Duty Lifting activity in 1971. Through its dedicated employees, SEFAC has always demonstrated inventiveness, professionalism and commitment to technology and safety that has enabled it to reach an unmatched status in this field and to win credibility as a specialist Lift manufacturer. SEFAC products features have helped to project them as a leader in the industry with series of products invented to solve problems of heavy duty lifting. SEFAC represents 45 years experience, 22,000 customers worldwide and unmatched situation in the manufacture and distribution of mobile column lifts and maintenance equipment. SEFAC is a specialist in lifting equipment for Heavy Duty vehicles and its key products is the heavy duty lift, useful to maintain heavy vehicle. SEFAC has three main activities: mobile lifts for road vehicles, heavy duty mobile lifts for railcars and a service department. SEFAC in its 45 years of experience in the lifting industry also developed products for rail sector. This company has capacity to develop products for a set of 4 columns or for a complete line with 36 synchronized jacks with a global capacity of 540 tons. The Organization also offers large variety of equipment that can be used around your vehicle lift. The range includes stand and trestle and also transmission jacks, hydraulic wheel dollies and cleaning equipment. 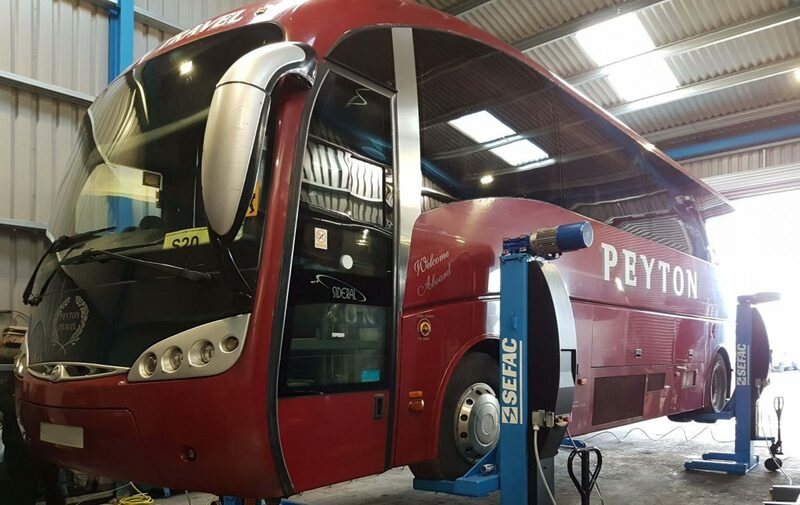 This also covers from bus lifting solutions to vehicle stands, and all SEFAC products are dedicated to heavy duty workshops. The company research and development department is ever working hard to make lifting for vehicles easier. In January 19th, 2017, the French President François HOLLANDE visited the SEFAC factory in Monthermé in the French Ardennes and having discovered the process of manufacturing of SEFAC lifts and maintenance equipment. The President was highly impressed with the state of technology of the companys products. For this reason, the auto industry has come to rely on the experience and the rugged dependability of their automotive industry heavy duty lifts. These lifts are engineered to safely and efficiently manage heavy loads and short cycles. The company provides you with technology of heavy duty trucks lift that helps you save time as well as maintenance cost on their lifts and equipment as their build in components are strong and durable able to withstand any condition. When you choose SEFAC, you acquire a unique source of global experience and knowledge combined with local know-how to empower your lifting and increase your productivity. The company has a unique understanding of how lifting can meet your process requirements and will deliver the right lifting equipment and service to match your needs. From time to time one unique thing about SEFAC is their exhibitions which are always packaged to expose clients to their products such as Solutrans exhibition which was held between November 21st, 2017 and November 25th another one was Equip Auto exhibition which was held between October 17th, 2017 and October 21st, Bus world exhibition was also staged between October 20th, 2017 and October 25th. Also APTA Expo was held between October 09th, 2017 and October 11th. All these are geared towards educating the clients and gaining brand loyalty.